The second day was awesome. 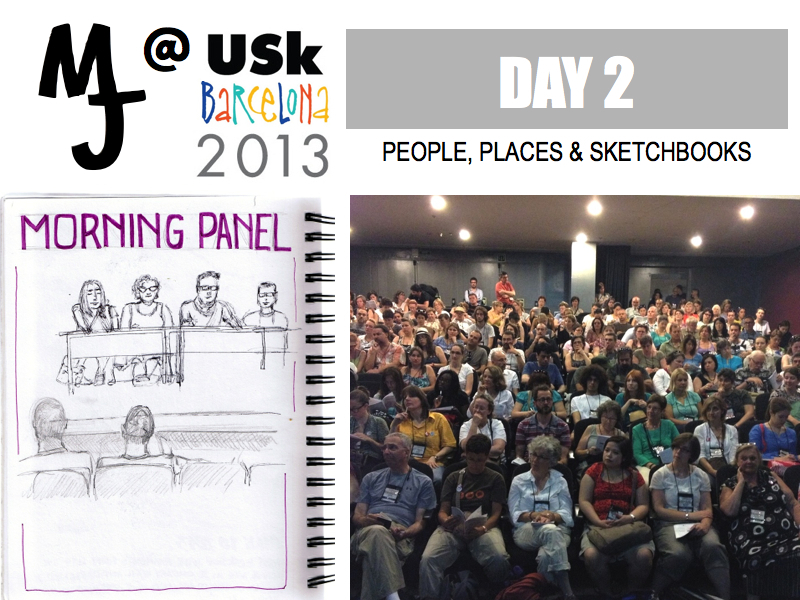 During the morning panel we got to hear from some of the lecturers about their experiences of from the previous day. It was neat to get a glimpse of what I missed. 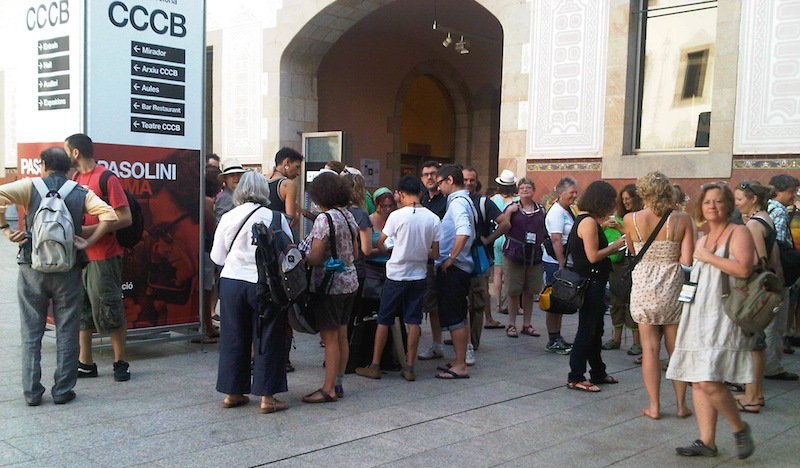 There were too many workshops for me to attend them all unfortunately. 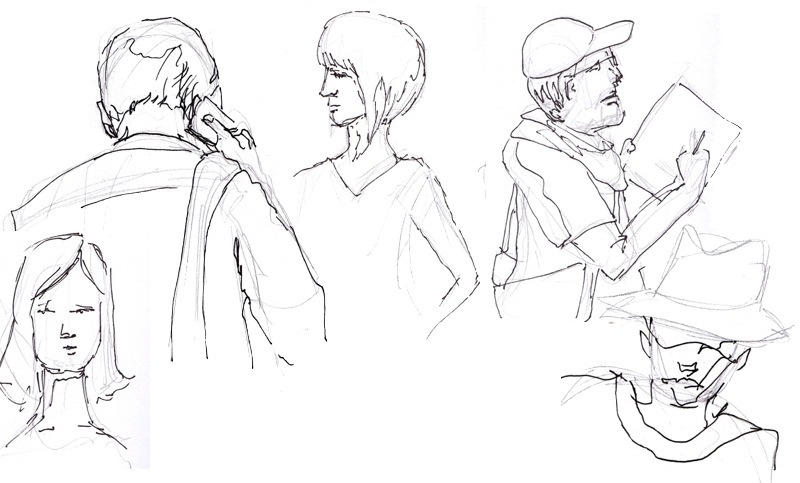 I also sketched the members of the panel to practice drawing people as they move around. The room was full even. You can see a portion of the people who came to listen to the panel, including myself above. 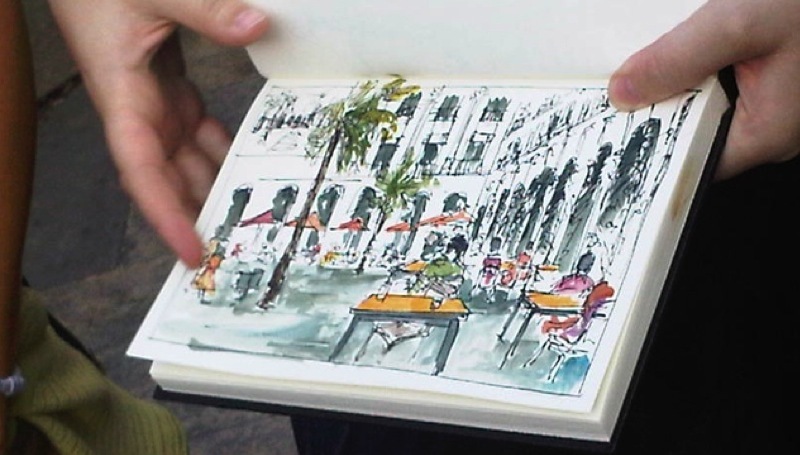 (photo above courtesy of the urban sketcher facebook group). 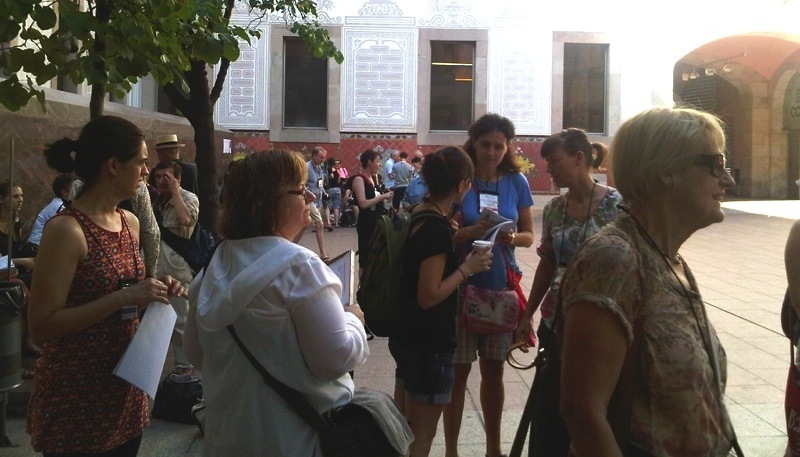 Every morning all the groups gathered in this beautiful inner courtyard where the teachers would hold up a sign with the letter of their workshop and the attendees would gather around before heading to their specific locations. Every morning was hot, sunny and beautiful. 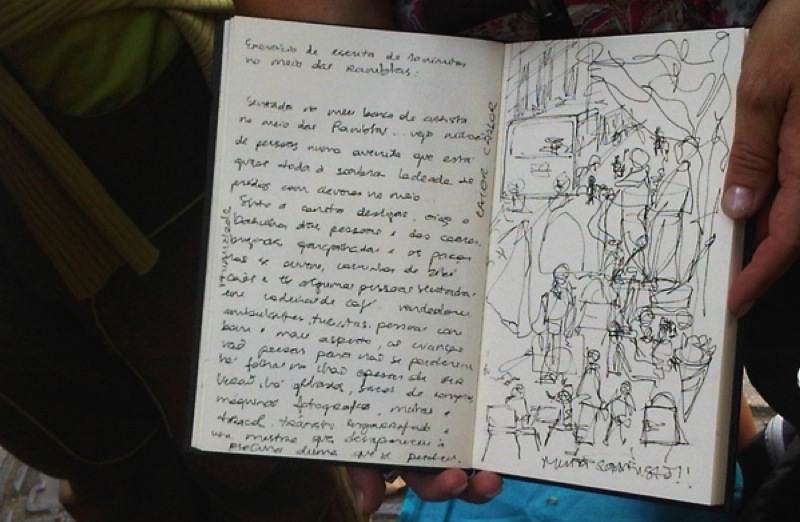 That day I took a few minutes before the first workshop of the day to do a little people sketching. I really enjoyed this workshop. 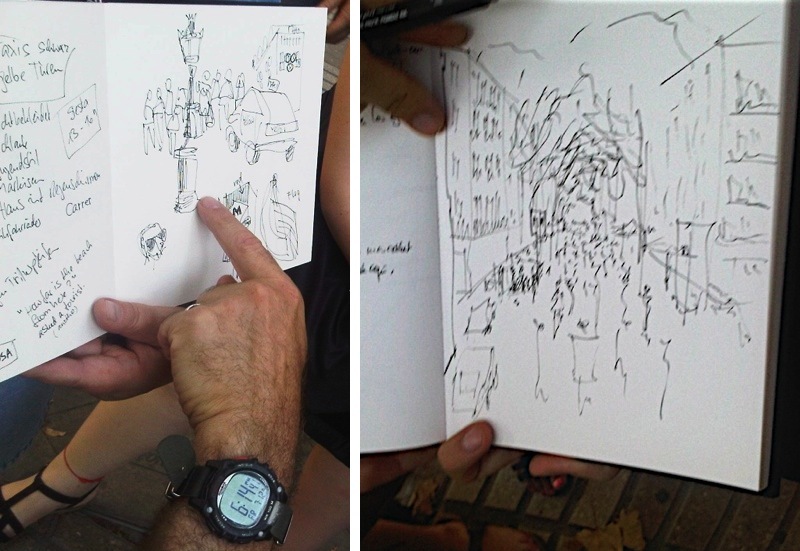 We learned Marc's technique of drawing people in motion in one of the busiest place in the area. It was not easy, but it was a lot of fun. 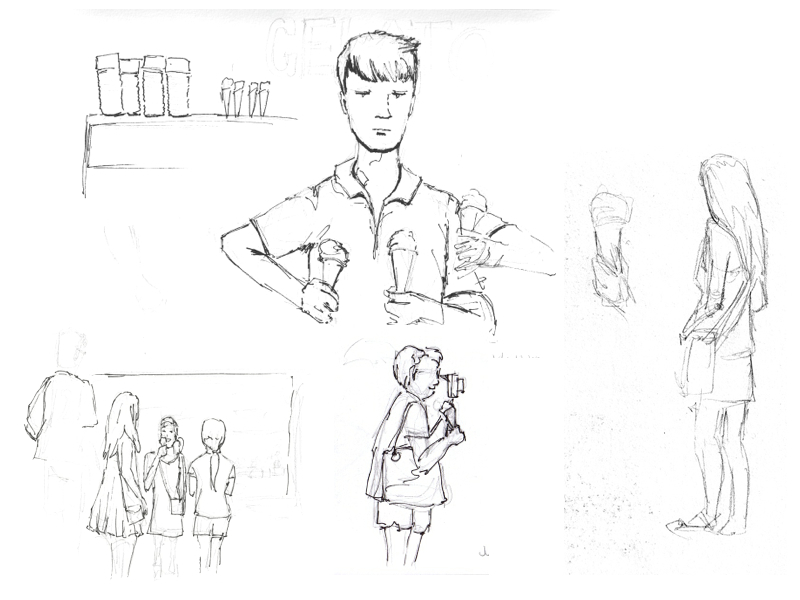 The first exercise was to draw basic shapes, gesture of people's head and hands in order to establish their character in pencil and capture their essence. It's interesting to see how you can capture someone's personality with a few lines. Then we used a pen to create the shadows and details which provided a focal point while adding clues as to where the shades and colors would go later on. This is where a brush pen become very useful. I improvised with a Sharpie. 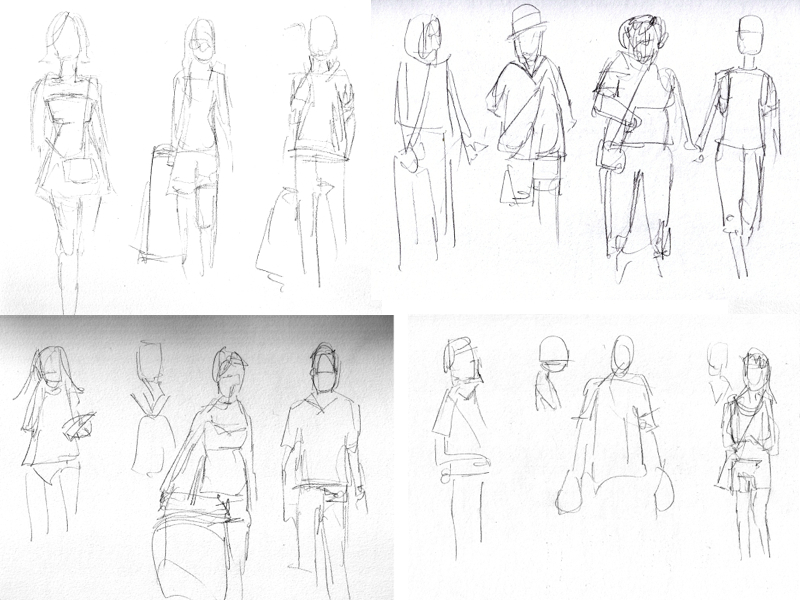 We redid the same exercise again, but drawing people entire body in motion. That was really hard. 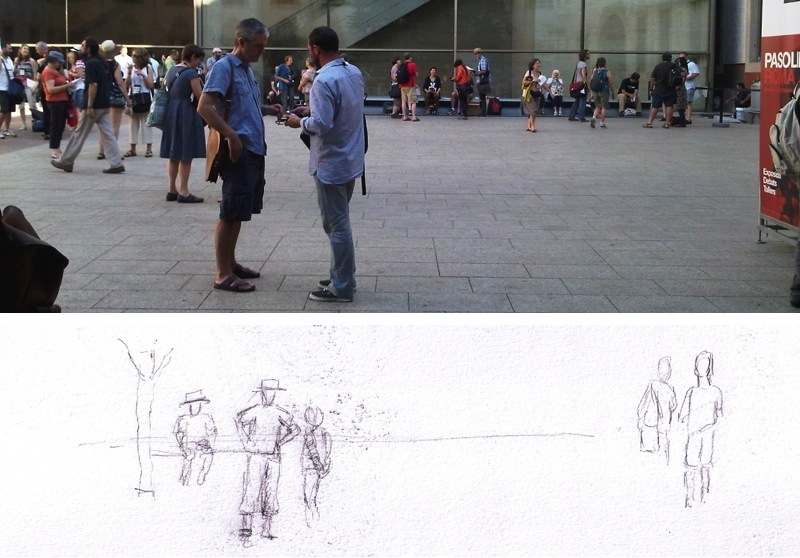 People move quite a bit and change position all the time, so it forced us to figure out what were the essential lines to be able to get a figure drawn before they disappear. 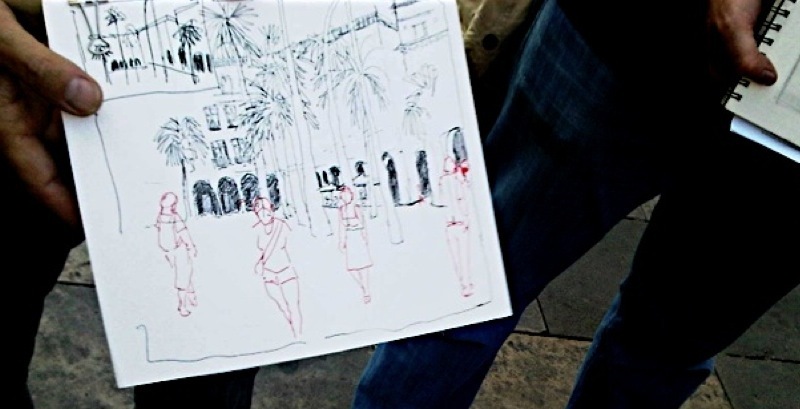 We also played a really neat "game" where we would select a subject walking towards us from a distance and finishing their portrait before they pass us. It's something I intend to keep on practicing. It was fun and challenging. 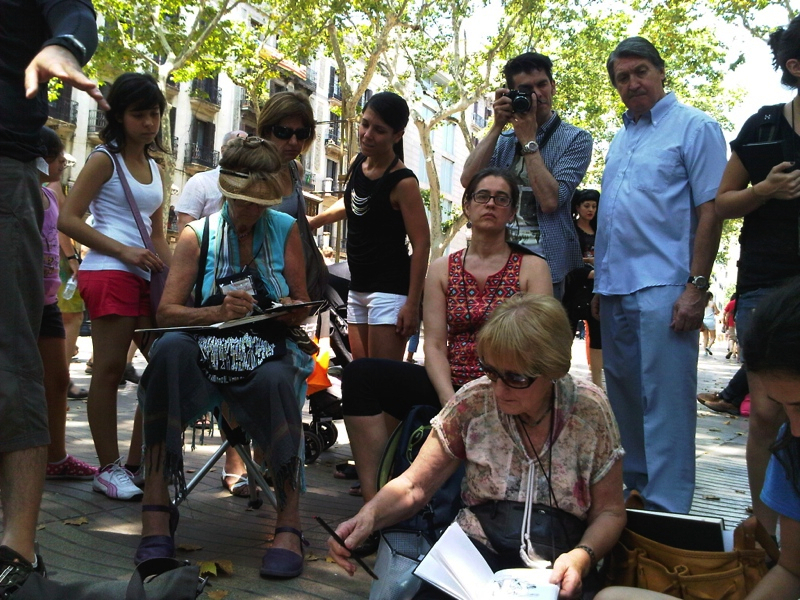 La Rambla is a very popular spot, our little group attracted a lot of curious passerby: Some taking pictures of us and our work, asking questions, and looking over our shoulders. 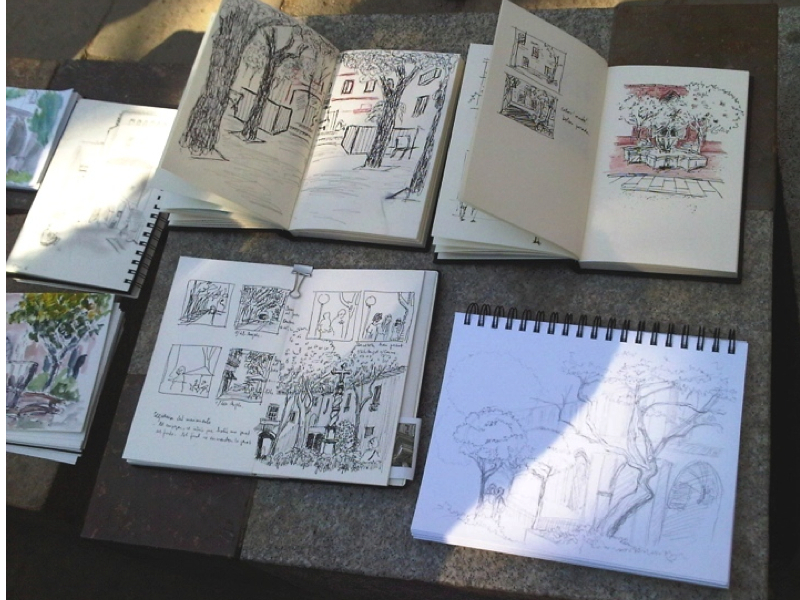 Urban sketching can definitely be a social activity/experiment. There was even a guy with a professional video camera recording what we were doing. Maybe it was for one of the local tv station as the symposium did make the local news. 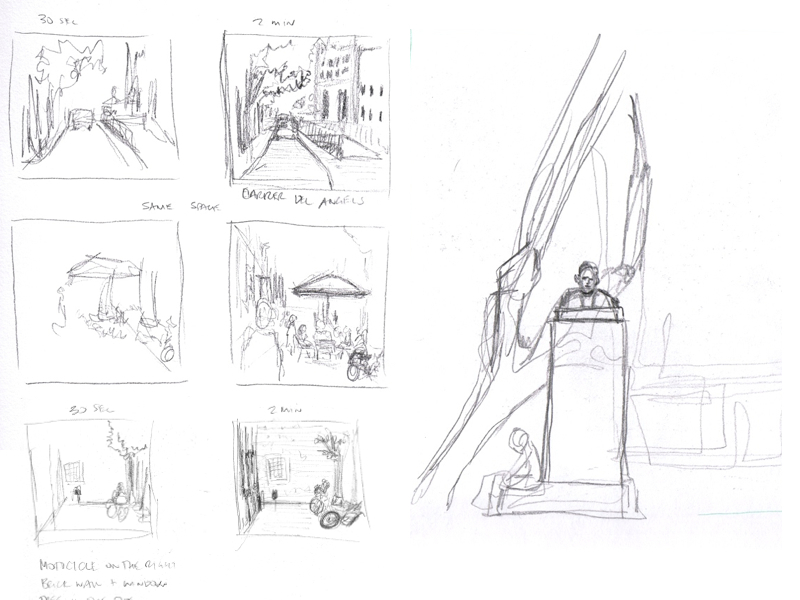 The last exercise was to create a storyboard on one particular topic. What a great concept! I never thought of that before. There were a lot of vendors in that area and I chose a gelato stand. It's too bad I didn't have time to add some colors, but I love the concept and will definitely work doing more of those in the future. 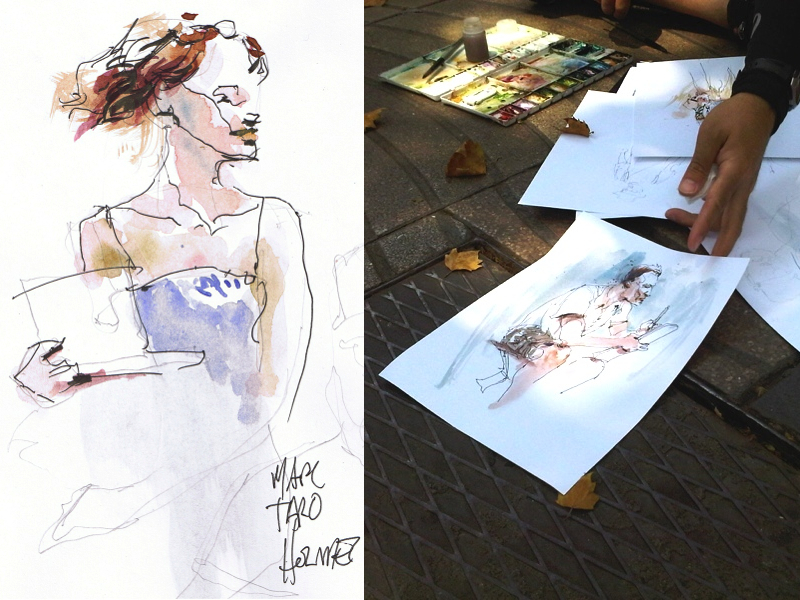 Marc took the time to also show us his watercolor techniques towards the end of our session and gave us tons of information. He's really talented and understand the human anatomy very well. 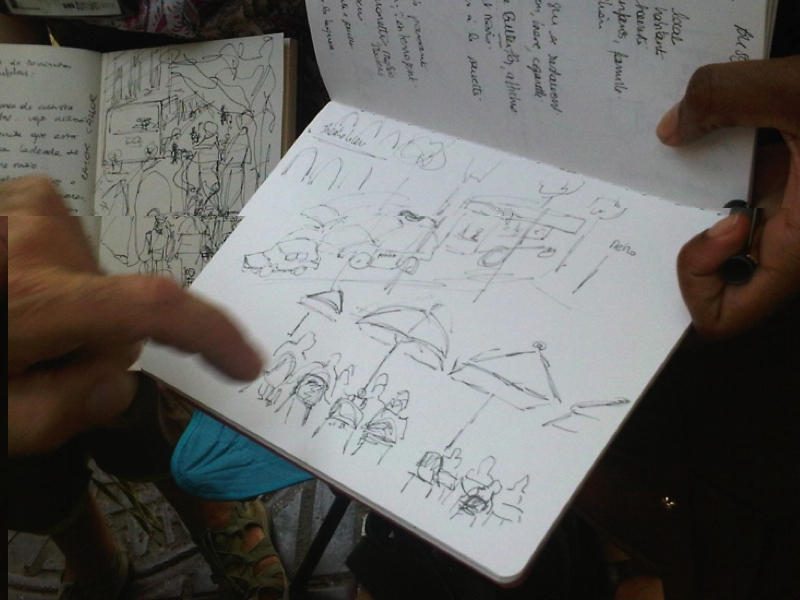 I was impressed at how he knew exactly what goes where if you were missing a body part from drawing people in motion. 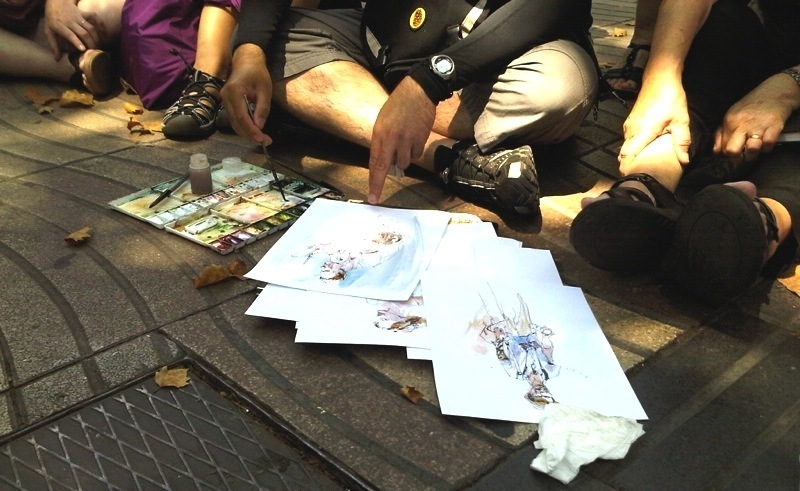 I learned later on from a fellow attendee, that in order to get to that level he attended figure drawing classes 3 times a week for a full year in order to master this skills. Obviously it paid off. For me, this workshop holds the record for the most sketches done in 3 hours : 11 and the most information gained in one session. 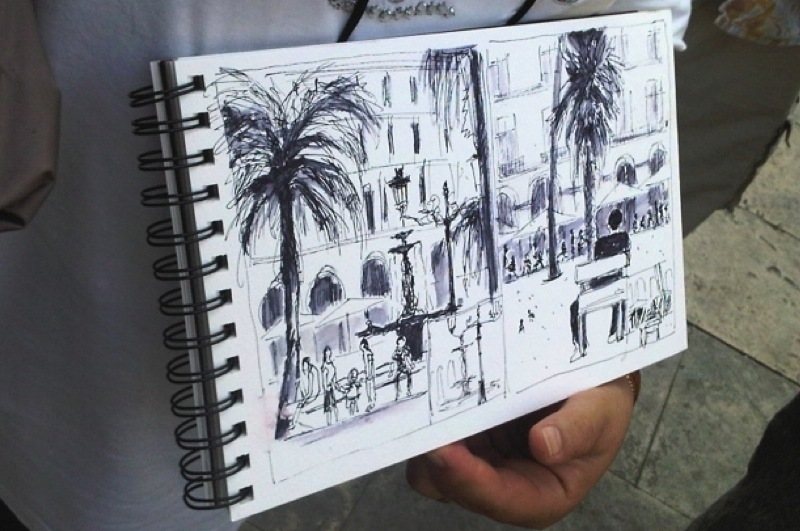 One of the participants said it was more of a a sketching marathon. We did walk a lot, but it was so much fun. 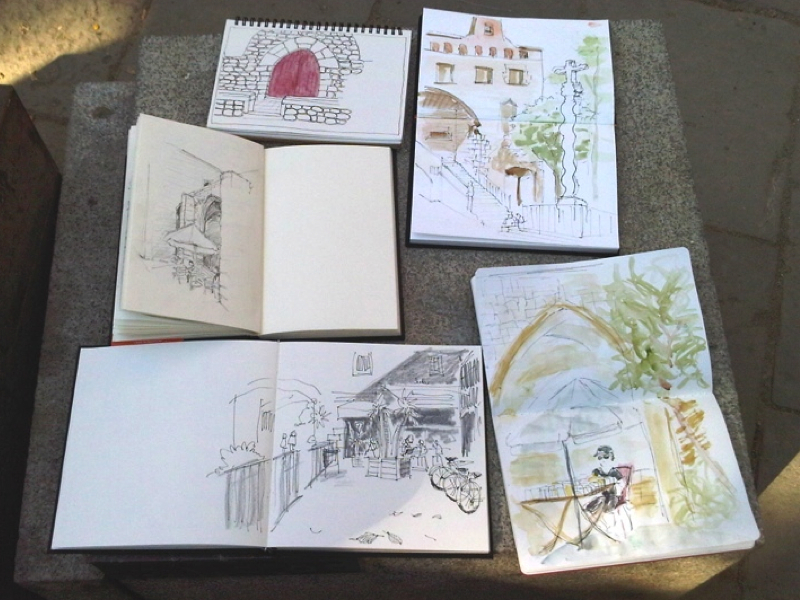 The first group of exercise was to create small sketches of the same area twice. The first time in 30 seconds and the second time in 2 minutes. You can see above on the left hand side my results. As we were doing this he also taught us about paths, transitions, entries and point of focus when it come to composing a sketch. It was a little crazy, but I quickly realize that the 30 second drawing enabled me to focus on what's important and what to focus on. So by the time I was doing the 2 minute drawing, I almost had time to space. 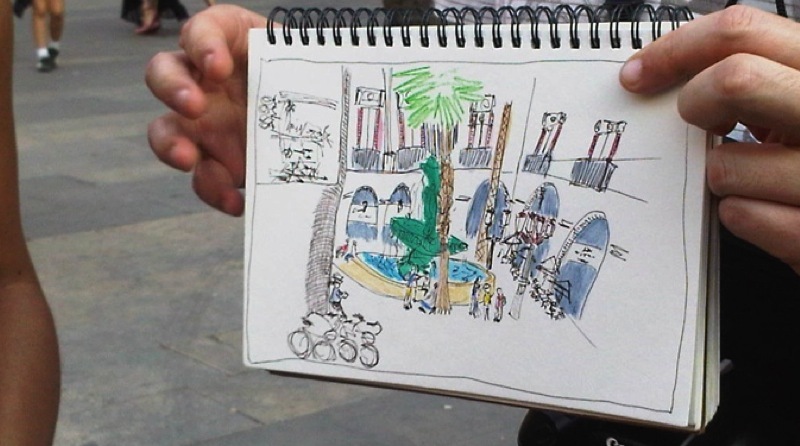 Mind you, if he had told us we had 2 minutes to do the drawing in the first place, without the initial 30 second drawing, it would not have been as completed. So that little trick worked. 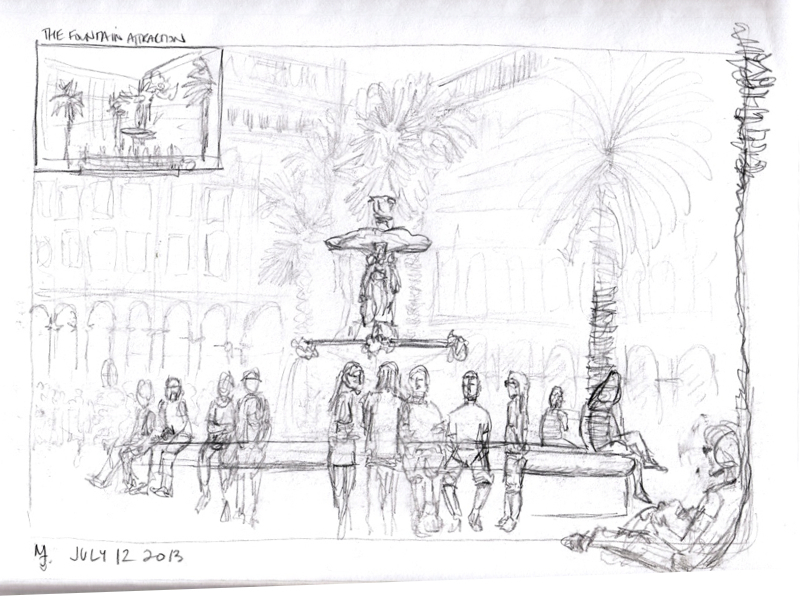 Then we did an exercise where we had to draw a statue without looking at the page or taking our pencil off the page. Then we were able to take some time to correct it. 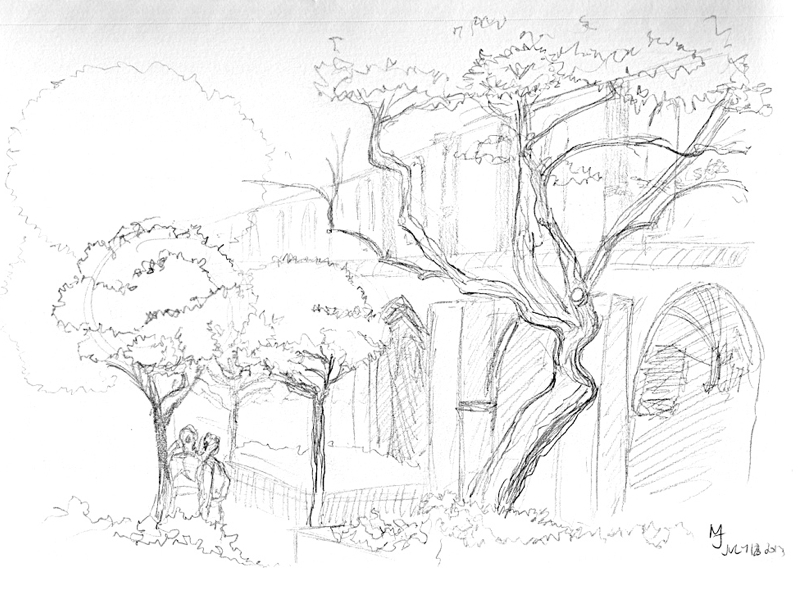 I learned in this little exercise that you don't need to look at your drawing that much when you sketch. 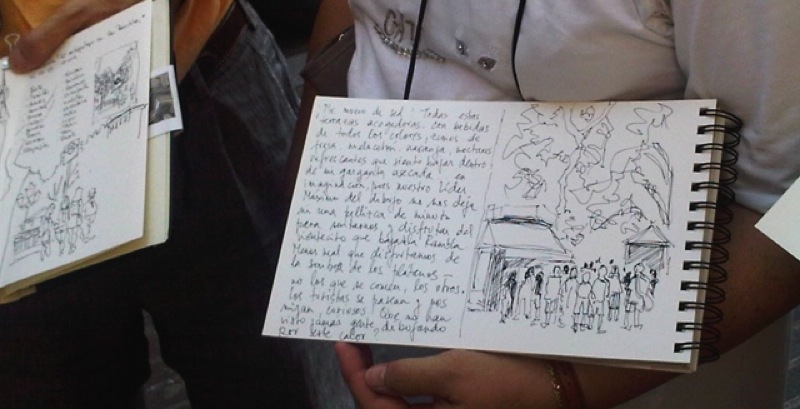 It's more important to look at the subject and your drawing will be just as good, or even better. 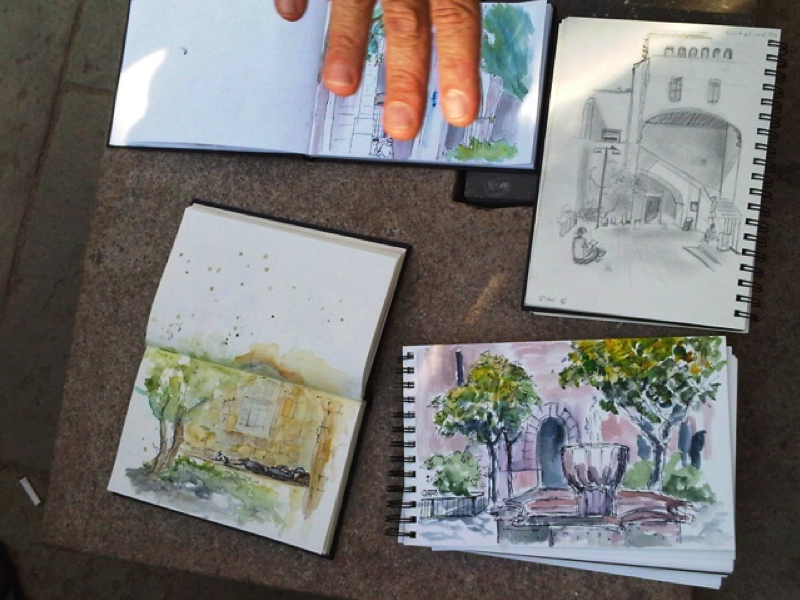 Then we had a little more time to draw in this beautiful courtyard along the way. 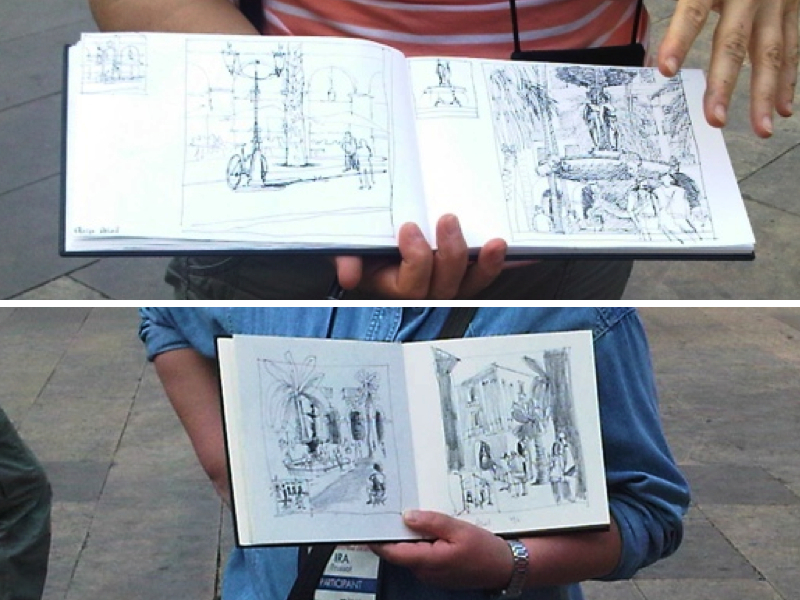 Above is my sketch and below are the sketches of fellow attendees. 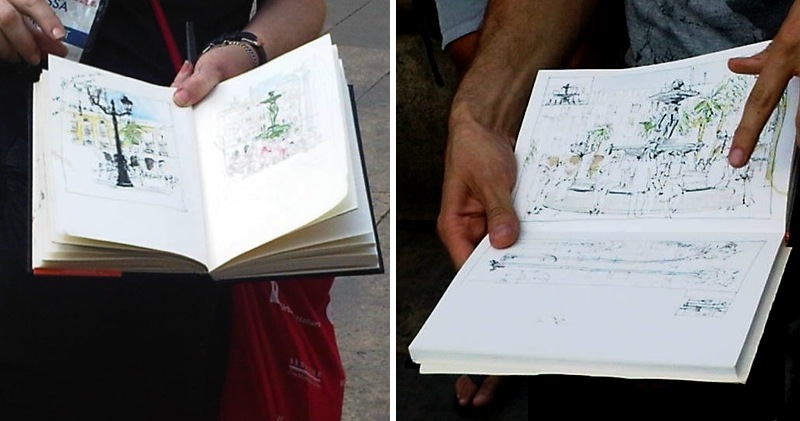 I love that Richard took the time to go through each drawing and commented on what worked and why. 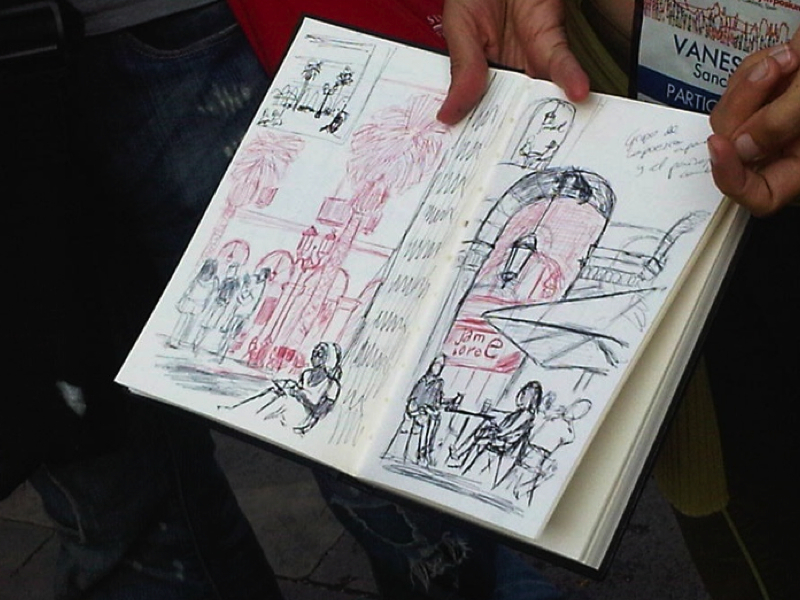 I got a little trigger happy and took pictures of almost everyone's sketches. It was very inspiring. 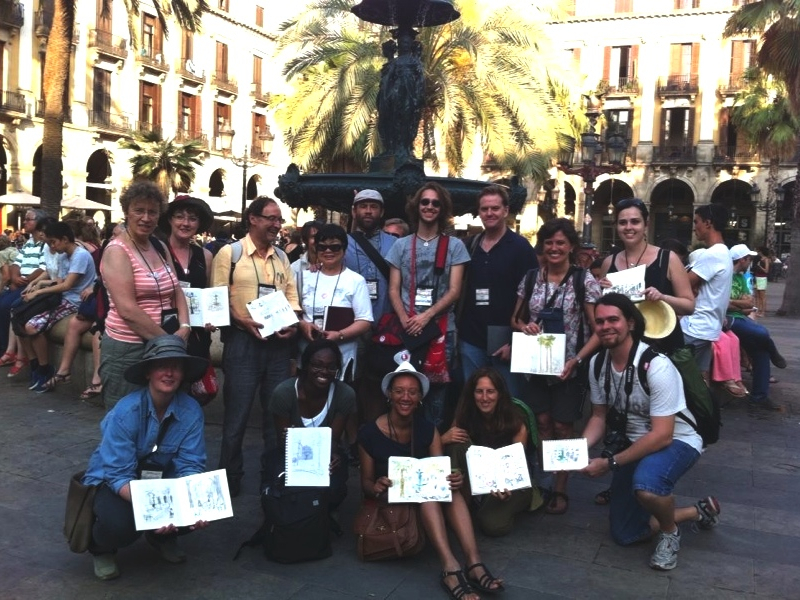 After that, we went to La Rambla and did another really neat exercise where we started by describing the area in words first (what we saw, how it felt, etc.) 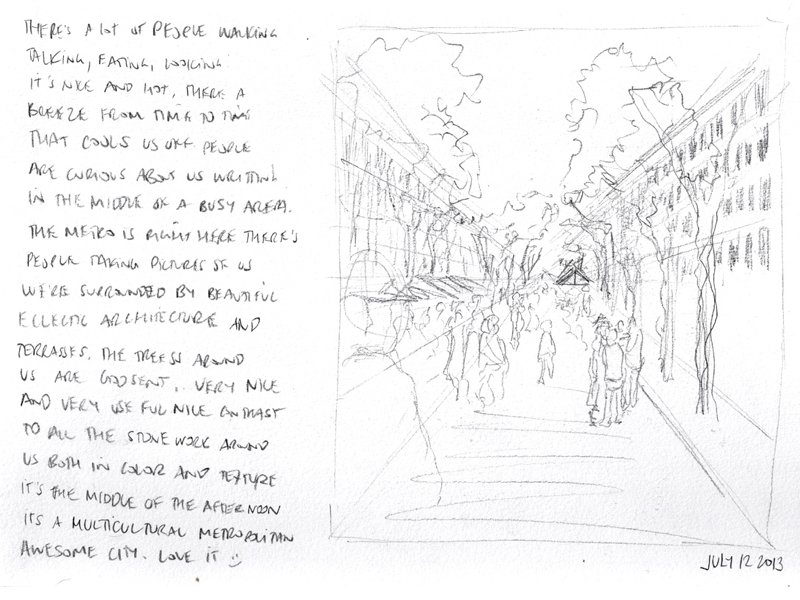 and then drew the scene, bearing in mind what we had just written. Below is my take on this exercise. 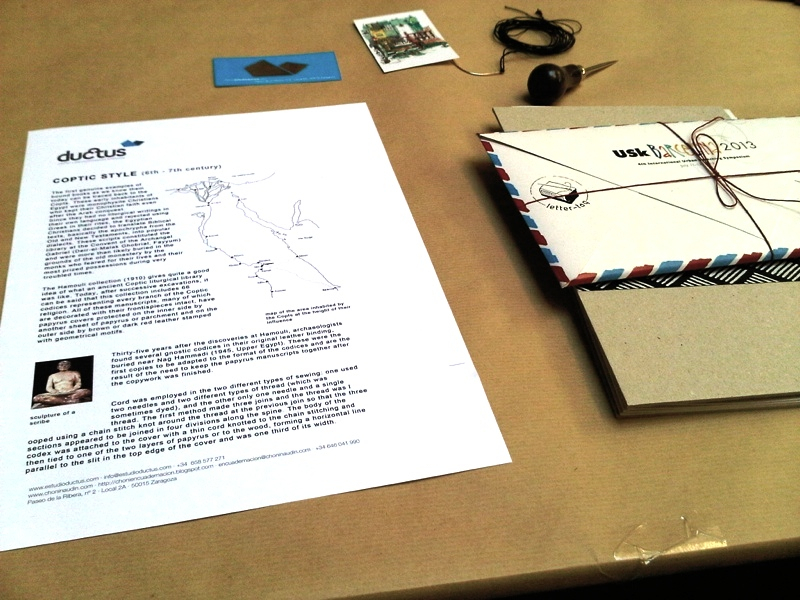 I even included a bit of what I learn in Luis' class the previous day. I also took picture of fellow attendees. 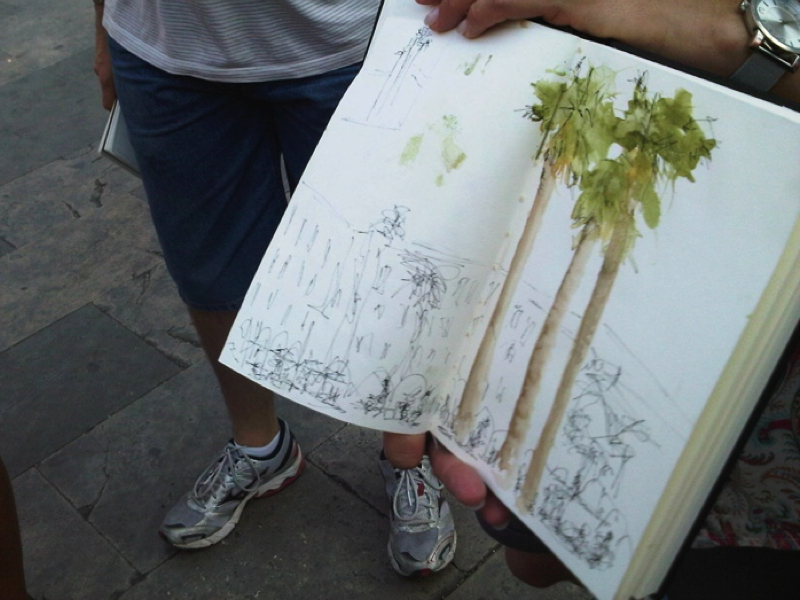 How awesome are their sketches. 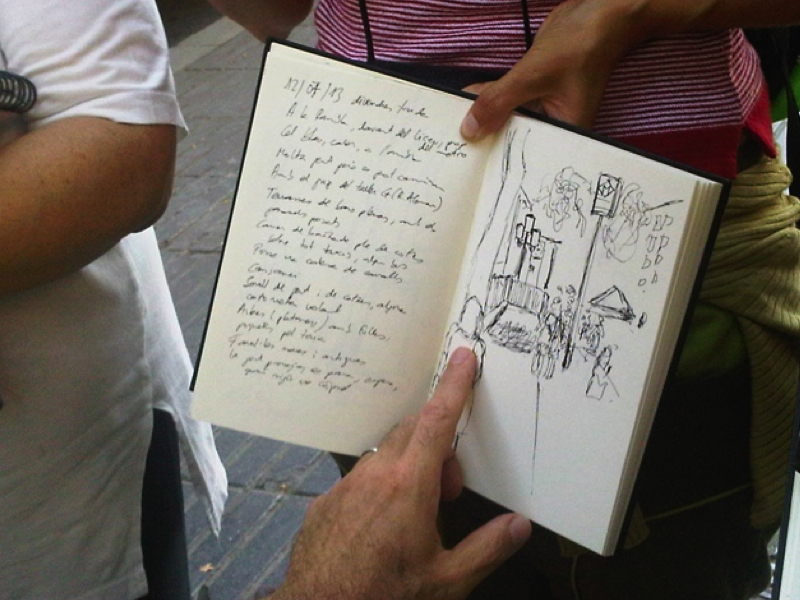 We then continued to another beautiful area called Plaça Reial, where we had to create two sketches using everything we learned during this workshop. Here are my two final drawings. I used the method of doing a quick little sketch before and then the larger one, integrating what Richard taught us and was really happy with the result, even though I didn't use colors. 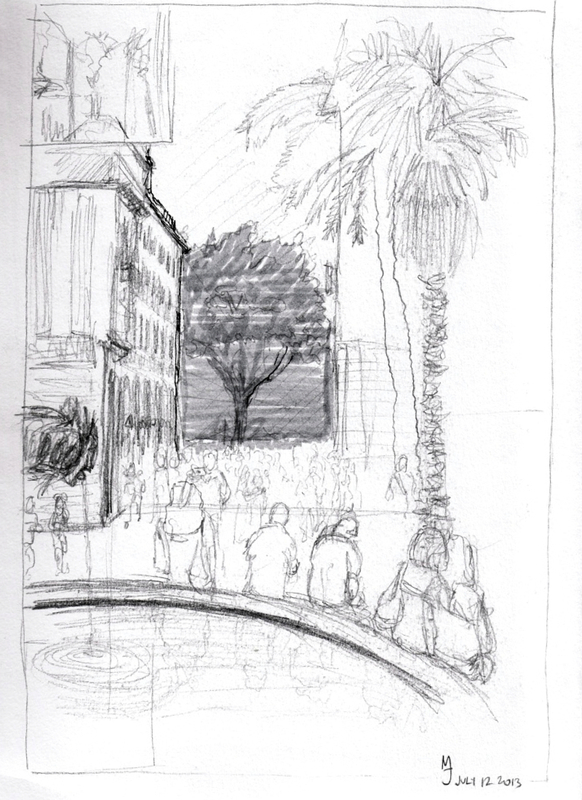 There was a really nice fountain right in the middle of the plaza and I integrated the fountain in both drawings but from two different perspectives. I couldn't help but take pictures of everyone else as Richard was going through them and pointing out the elements that made them great. It's really neat to see different interpretation of the same place. Everyone is telling a different story and using unique methods and material. 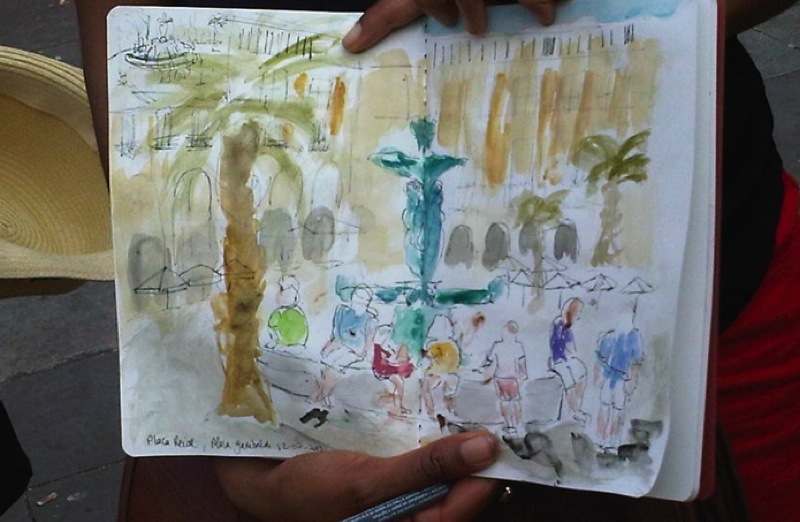 It was very insightful to see what happens when you use water soluble ink, or a different marker to depict people, or watercolor as an accent or to create the entire piece using mostly watercolors, some emphasized more on people, other on the palm trees, others on the architecture and other on the fountain.